Yes, you got it right! Now, the vehicles in Delhi will run only half the times they used to / can run. And this is all because of stupid pollution. Delhi government has come out with a radical plan to make Delhi pollution-free. According to the new rule, beginning January 2016, vehicles with odd registration number will ply on one day and vehicles with even registration numbers on the other day. 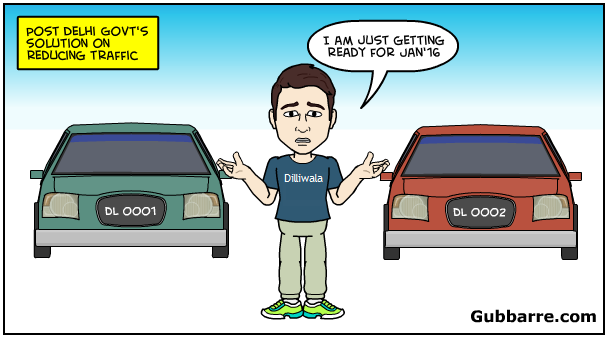 That means, in a given month, you will only be able to run ply your vehicle effectively for only 15 days. The government has announced this rule, but has said that the details of implementing this rule are being worked out. Though, it has been made clear that Ambulances and public transport vehicles will not come under this rule. On asking other political parties, mixed responses were received. Some parties welcomed the decision but questioned the practicality of the rule, while others called it ‘anti-people’. Environmentalists have welcomed this ruling. Let’s assume for a moment that it will help reduce pollution. But, what about other industries that will get hit? It may sound weird but this directly impact the Auto industry – as vehicles will run less, they will depreciate slowly. And, slow depreciation means long life and lesser replacement purchase of vehicles. Which, directly impacts automobile sales! We support each and government which tries to resolve general public issues, even it means giving up on some conveniences for long term benefits. But, it is expected from the same governments that they come out with solutions which are practical, effective and thoughtful.